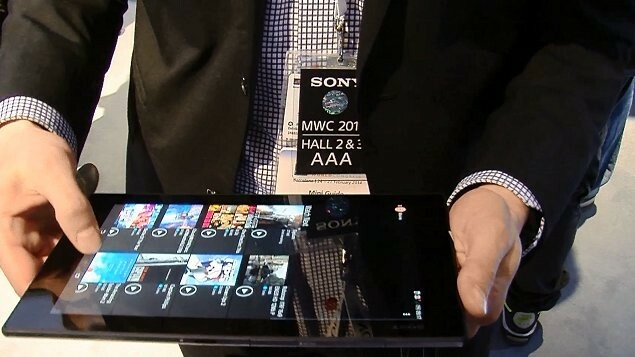 In addition to the popular Xperia Z2 smartphone, the Japanese company unveiled at MWC 2014 and the Sony Xperia Z2 tablet. The first thing you need to know about this waterproof tablet is that it will be on the market in two colors – black and white. The first waterproof tablet, which we tested last year, was really good. We threw it in the water and doing all sorts of things with him, and the second generation should be even better. By characteristics is very similar to the Xperia Z2 smartphone. But anyway we will analyze the most interesting features. Probably the strongest features of the new Sony Xperia Z2 tablet is its 10.1-inch IPS screen TRILUMINOS ™ Display for mobile, full HD resolution (1920 × 1200 pixels, a 16:10 aspect ratio, 224 ppi or pixels per inch). Sony is in this tablet installed its latest Sony TV technology that is specifically optimized for mobile devices. Some of the notable characteristics are Live Colour LED (vivid colors), wide viewing angle and very sharp image thanks to X-Reality for mobile technology. Another important characteristic is the sound. Sony Xperia Z2 tablet has a dynamic surround speakers that support S-Force technology. More speakers give great sound that has depth, so that this tablet will also like and those who play video games. It is interesting that they are placed so that they you will not block them with your hands and the sound will be strong and clean. It’s built in and “digital noise cancellation” technology that actually removes up to 98% of unwanted sound around you. Based on “Active Noise Control” technology that removes low and high frequency noise. Of course, the situation is even better if you put the headphones. It’s built in and Clearaudio + technology that actually provides better bass, treble and stereo, so the listening of the music will be a real experience. Sony Xperia Z2 Tablet is designed almost the same as the Sony Xperia Z2 smartphone, so you get the feeling that you have an enlarged smartphone in hands. It still has an elegant “cubical” look with slightly rounded edges, slightly more than the original tablet. Thin is a whopping 6.4 millimeters and weighs just 439 grams. Specially designed key for switching on and off, and all inputs and outputs are protected so that water and dirt can not enter. The Sony boast themselves that they have the slimmest waterproof tablet in the world, similar to the smartphone. In addition, the screen is scratch resistant, and you can throw it in the water at a depth of 1.5 meters and up to 30 minutes and nothing will happen. The new Sony Xperia Z2 tablet can be praised with a powerful processor and graphics. It is practically the same configuration that can be found on the Xperia Z2 smartphone. And Tablet boasts the latest four-core Qualcomm Snapdragon 801 processor at 2.3 GHz, while for the graphics is in charge Adreno 330 graphics chip, which is by testing for about 20% faster than the previous chip (Adreno 320). It’s built-in 3 GB of RAM. With regard to power, the Sony have built a special Battery Stamina Mode that optimizes battery consumption (can last several times longer). From wireless connectivity with the outside world supports Wi-Fi, NFC, Bluetooth, and there are Miracast and DLNA. As far as the camera, the Sony Xperia Z2 tablet has a rear camera of 8 MP which supports RS Exmor ™ for mobile sensor images, as well as popular HDR, and has a 16x digital zoom. The front camera is 2.2MP. Of course, much weaker than the Z2 Xperia smartphone, but should be strong enough to capture high-quality images. You can also check Sony Xperia Z2 Tablet video. Summary : Sony Xperia Z2 is great waterproof tablet. If you had any doubts to buy this tablet, don't. This is a perfect waterproof tablet which will suit anyone needs.